GHost has been invited to haunt the B&B Space in 14 Tontine Street for the duration of the Folkestone Triennial (25 June – 25 September). 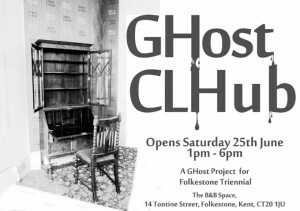 Our project GHost CLHub has manifested in a corner of the B&B and will open its doors to the public on 25 June. Over the three months of the Triennial GHost CLHub will explore the hidden narratives of ‘hauntings’ emanating from Folkestone and the Shepway area and our corner in the B&B will grow from the initial exhibition into an archive of artworks, artefacts, documents, films, stories and other entities. For the opening of GHost CLHub we will be showing haunted artworks by Miyuki Kasahara, Calum F. Kerr, Domingo Martínez Rosario, Sarah Sparkes, Ricarda Vidal and Cathy Ward. Between 26 June and 1st July we will install temporary headquarters in the Cultural Baton – find us in Folkestone Harbour on the 26th and in the Leas from 28 June to 1st July. Visitors can engage with and contribute to the ghostly archive documenting uncanny tales from the Shepway locale. On display will be films by GHost artists, publications, artefacts and illustrations responding to local ghost stories. There will also be interactive information about the project. Visitors will also have the chance to acquire membership of “GHost CLHub”, take away GHostly souvenirs as well as leaving some ghostly keepsake behind for the archive.